Cats and fish are hard to separate, and as soon as you open a tin of canned salmon for dinner, your little kitty would come running to have its share. You would certainly want to give in to its demands, but it is better for you to know how safe salmon is to have for your cats. There have been mixed opinions and a lot of contradictions about whether you can give your cats salmon or not. While some say that its rich contents of Omega-3 fatty acids, vitamins, and proteins are not just beneficial for humans but also cats. However, others are of the opinion that most cats suffer food allergies when given fish, not approving of salmon to be a healthy food option for them. Besides this, cats should have a diet rich in the amino acid, taurine that is essential for their overall development, which can be found in meat and other dairy sources. Since salmon does not have a high amount of taurine, adding it to the cat’s diet may not be a beneficial option. 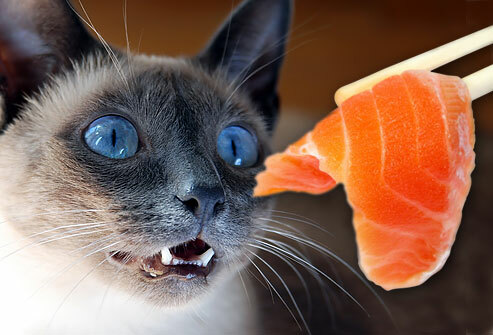 No, you should not feed your cats raw or uncooked salmon as the bacteria present in them may lead to food poisoning. Another health hazard caused by raw salmon is vitamin B1 deficiency since the enzyme thiaminase present in it destroys thiamine. Canned salmon is also not considered a healthy option for cats to eat as they lack proper nutrients and are high in sodium as well as other additives since they are processed. Smoked salmon is also a strict no-no for cats since they too are very high in sodium that may be dangerous for felines. If your cat is only too intent in having the fish give him a little amount of it in its cooked form, or you may even opt for cat foods or treats that contain salmon as they would not hurt your kitty at all. If your cat shows any abnormalities or allergy symptoms after having salmon, contact the veterinarian at the earliest. Published on December 11th 2017 by admin under . Article was last reviewed on 19th December 2017.